Jesus "Chuy" Garcia spoke at Rainbow PUSH Headquarters Saturday morning. 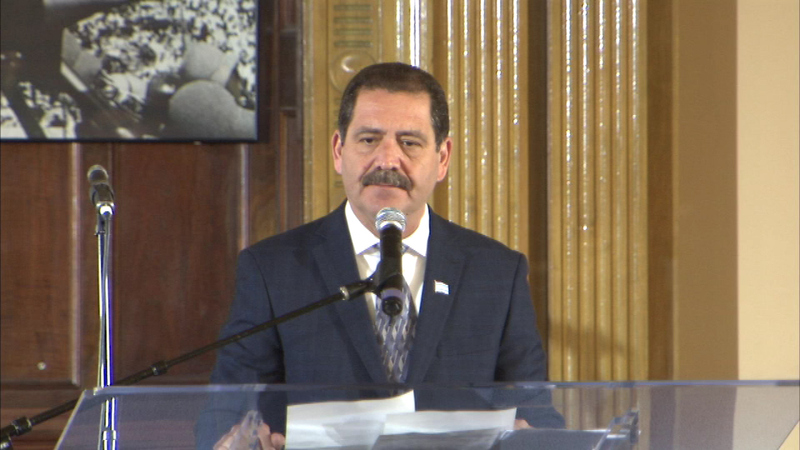 CHICAGO (WLS) -- Both candidates in the race for Chicago mayor continued their campaigns Saturday leading up to the April 7 runoff election. Jesus "Chuy" Garcia spoke about the historic march on Selma Saturday morning at Rainbow PUSH Headquarters. He called it a pivotal moment in our country's history. Garcia also expressed his gratitude for those who stood up for freedom 50 years ago and urged the crowd to exercise the right to vote. Mayor Rahm Emanuel was on the South Side Saturday morning going door-to-door talking to voters as part of an event called "Running with Rahm." Mayor Rahm Emanuel went door-to-door talking to voters in an event called "Running with Rahm." The mayor's office said he listened to their ideas and concerns for the city and shared his vision for Chicago's future. The goal was to contact thousands of voters. There are only a few days left to register to vote in the April runoff elections. Tuesday is the deadline for those registering to vote for the first time. To register you must be a U.S. citizen, at least 18-years-old by Election Day, and be a resident of your precinct at least 30 days before the election.